I cook. I really enjoy cooking. I like trying new and deviously nutritious recipes like cabbage rolls or strawberry, buckwheat, oatmeal muffins and making up concoctions while crossing my fingers hoping that they turn out. For example, I’ll secretly throw a bag of spinach into about anything or the other night I used mango habanero kale chips (that everyone gagged over as chips) instead as a bread coating for a cream cheese chicken recipe. I enjoy creating homemade healthy meals for my family; it’s a way I feel like I can show them love and when it comes to my husband, there’s some saying out there about the way to a man’s heart…. I strongly concur that delicious food is an effective ways to reach a man’s heart. Dinner time generally starts at around 5:30 and as soon as we sit down the timer is set for 30 minutes; which at times can feel like 30 hours. I hate sounding drill sergeant like in how we do dinner but we have some majorly pokey eaters who would sit, swishing their food around and around and around their plates, conversing about anything and everything, all to avoid eating at any cost. Dinner time is really not something we want to prolong for hours with 7 young children. The 30 minutes was implemented and has made everyone focus on the fact that we are sitting down, as a family, to enjoy in partaking of nutrients together. If dinner is eaten within the 30 minute marker, dessert is offered- always. We don’t do snacks, we do dessert. Having a snack immediately after school has, in the past, left me with a bunch of kids who had no interest in eating dinner. The compromise has become that there will always be dessert; whether it’s brownies, cake, strawberries, or a piece of candy, there is dessert offered 95% of the time. To get dessert though, each Ronne individual must finish within the 30 minutes and lick their platters clean. That means we eat the crust on sandwiches, the slimy green stuff in the casserole, and the pepperoni on the pizza. Everything is everything – period and then they get their cake. Each child is allowed one food item a year that they absolutely do not have to eat. Most of the kids were not real wise in their decisions this year and picked things I never make, like spaghetti squash and bread pudding. One child was particularly wise and picked peas, an item he doesn’t necessarily detest but an item he knows I make all the time. Therefore on nights when peas are presented he doesn’t have to eat them. The other kids have caught on and when it comes time to renew the contracts, I believe they will all pick smarter, and I may not be using peas anymore, hmmmm, okra anyone? 4:00 o’clock p.m. – the most stressful part of my daily 24 hours. The week days are relatively easy until I notice the clock rolling around to about 3:45 and my heart begins palpitating a bit and my breathing becomes hurried as I brace for the onslaught that’s about to occur. Josh and Jada nap from about 2:00-4:00 on a pretty consistent basis. Luke comes home between 4:00 and 4:10 and the kids get off the bus about a mile down the road at 4:15. At about 3:30 I begin preparations for dinner. Making dessert, pounding out chicken, cutting veggies -just generally having everything prepped and ready to go before the clan enters the house because if I don’t have it chopped, prepped and in pots and pans my anxiety levels start to soar through the roof with not only the immediate ambush of random conversations regarding who did what to whom on the playground or whose teacher was absent or whatever it may be, but also the added bonus of four kids noticing that mom is frantically working in the kitchen and they all desire to “help” at this point. I’ve discovered if the preparations are done there is no need for anyone to offer their assistance, and there is additionally no need for any curious onlookers to hang around wondering what little morsel of uncooked goodness they may be able to deviously pop into their mouths. It probably sounds horrible that I don’t want the assistance of my little angels, but honestly, it is stressful to have 6 miniature humans (and one mama) and 60 tiny fingers all vying to do something as I’m just trying to get a decent meal on the table for the family. They, the children, will usually engage in their afternoon jabbering for a few minutes upon entering the premise, notice that the kitchen seems lacking of any sort of fun or rewarding activity, and run off to play. So at about 4 it truly begins. The babies are the first to be present, arising from their restful afternoon slumbers. If the sun is shining, they go outside and play, if it’s not, they play in the basement. They are fairly easy and compliant and they get along really well on most days. Then Luke comes home. His bus comes to the front door which makes it somewhat more manageable. I walk him off the bus, give him juice, take off his braces and shoes and bring him to his room where he is very content to watch Veggie Tales until dinnertime. Then – I brace, truly brace for the 4:20 boom. I generally sit very nonchalantly on the couch, maybe writing a bit or checking email acting like life’s a breeze, even though my innards are beginning to churn with anticipation and anxiety. I hear the minivan reel into the garage (my husband usually gets them on his way home from work), and the rolling, thundering patter of 8 small feet, the cacophony of 4 boisterous or argumentative voices, depending on the day, as they all at once pounce their glorious presence and muddy shoes upon my once quiet, controlled, and semi clean domain. It is mind boggling and literally mind blowing. I swear I lose brain cells in this 10 minute conversational stretch and then just as quickly as it begins, it ends, and they all scamper away to their own private destinations. I have absolutely no system in place for this chaos, well, other than having dinner preparations well under way before they walk in the door because I truly would go mad if I were one of those moms who looked at the clock at 5:00 and thought to myself, “I wonder what I’m going to make for dinner?” We would eat PB&J every night if that’s how I worked, not that the kids would complain, actually they would probably love it. Dinner time is next, stay tuned…. The next system in place that assists the Ronne family towards a more peaceful, idyllic experience together has to do with laundry. First, a disclaimer, laundry is not my thing. The Lord did not gift me with the ability or the desire to have perfectly pressed, folded, fluffy, and sweet smelling laundered items. My laundry is kind of embarrassing; it doesn’t really smell like anything because I usually forgot fabric softner and along with that nice crisp feeling due to a lack of softner, there are usually a few wrinkles because I don’t generally get around to folding it immediately, (actually I often fold it a few days after it has come out of the dryer but more on that in a minute.) I just don’t care that much (it’s not on my priority list as I detail in the post, Not That Mom) and as moms we only have so many minutes in a day and laundry is not top on my list of things that I want to accomplish well. If it’s clean, I’m happy. Admittedly, I do have two washing machines and two dryers which has been a life saver with the amount of clothing, towels, and bedding this family goes through on a daily basis. My laundry schedule begins something like this: immediately upon waking, I go downstairs where the family avoids me like the plague for about 10 minutes; just enough time they have estimated for me to make a cup of coffee and get at least a few life saving drips down my throat. I then get Luke ready and once he’s dressed and drinking his morning cocktail of yogurt and juice, I head to the laundry room where I throw a load in one of the washing machines which consists of everything I gathered up from the previous evening. After a few more sips of coffee, to the point where my brain starts firing on all pistols, I head upstairs and pull the bedding from one individual’s bed. This is also a system in place where I wash one family member’s bedding a day, although certainly not written on stone tablets but my intentions are pure nonetheless. That person’s bedding goes into the other washing machine. 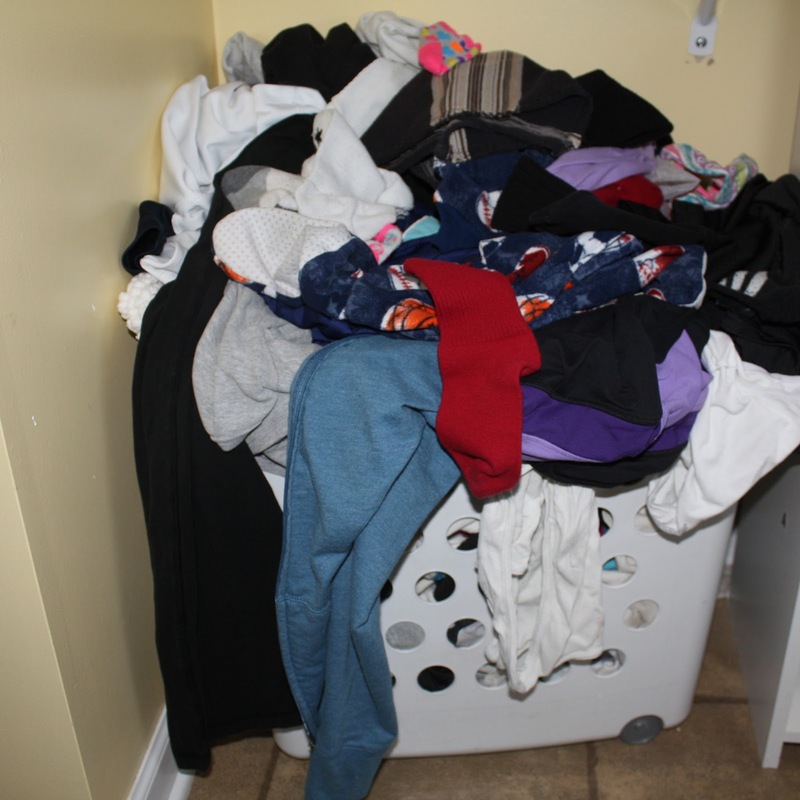 My day continues as I throw those two loads into the dryers and when they are complete, I begin 2 more loads from one of the 4 dirty clothes hampers from around the house. All in all, I usually do 4 loads a day. I have a large laundry basket where the items get promptly thrown right out of the dryer. I have mentioned before that I have a complete disdain for sock sorting. This large basket is also where the hundreds of stray socks live until Ryan gets around to them. The clothes are washed, they are dry, and now they will sit in this basket until I get around to loosely folding them – which in all honesty, could be in a day or two. I do not enjoy folding but I recognize that it is a necessary evil of motherhood, and I also feel a little guilty because Ryan already sorts the socks, and I can’t actually expect him to fold all the laundry too…… can I? Doesn’t seem fair. Here comes the system part of it all, I have 7 plastic bins in my laundry room on shelves. Each bin has a child’s name on it. As I fold the clothes, they go immediately into that individual’s bin. 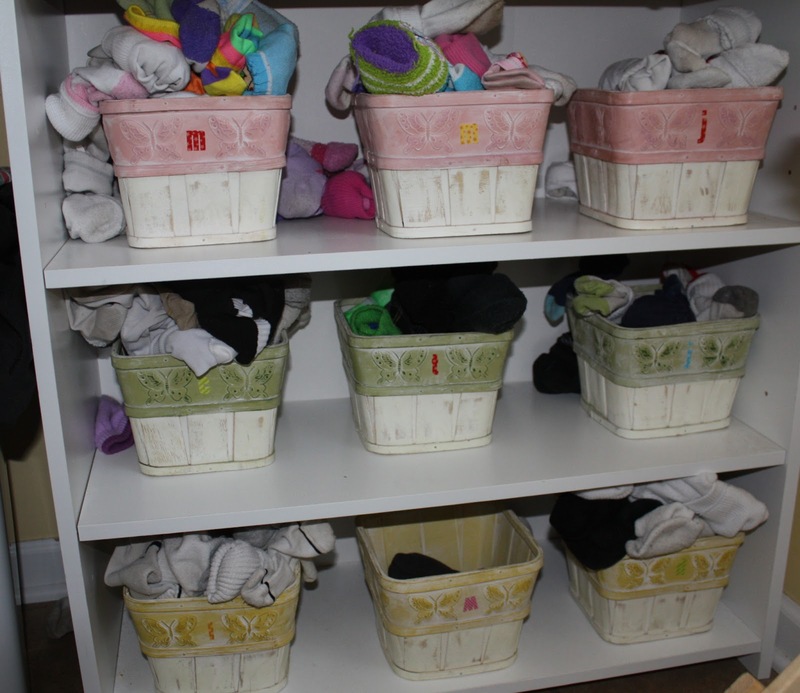 I also have 9 sock containers on separate shelves, also in the laundry room. As you already know, I do nothing with those but they are a helpful tool for my husband. Once an individual’s bin is overflowing, I ask them to put their clothes away and upon doing so they return the empty bin to its place on the shelf. The other small part of my system, amazon automatically ships me laundry detergent on a monthly basis with free shipping so I never run out. Voila, that’s it and the system starts all over again the next day, the endless cycle of dirty clothes forever and ever amen. I would welcome any tips in this area, like I said, not really my specialty but I’m certainly willing to learn from any experts out there! 2. How do you have time for your marriage? 3. Do the kids all get along? This answer is multi-faceted, first, we do it because we have to. That’s a pretty lame answer but it’s the truth. We have MANY systems in place that work really well, for example, numero uno system – THE BIN. This is a system that I grew up with and loathed with every cell of my being as a child. Funny how it made its way into my grownup family as well, although I like to think of myself as a kinder, gentler bin commander than the regime I grew up under, however, that could possibly be wishful thinking…. The bin (or the brown box that I grew up with) is just a plastic container that holds the children’s misdemeanors for the week. The system starts with a five dollar allowance for each of the older kids, Caleb, Tate, Mya, and Mabel (Luke is an “older” kid but he is not in that category for the sake of discussion.) They do their daily chores for this money. When they don’t do a chore well, or they forget, or they need multiple reminders, they get a ticket (whatever scrap paper I have laying around with their offense scribbled on it). This is placed in the bin whenever I get around to walking that way and it is worth a quarter. 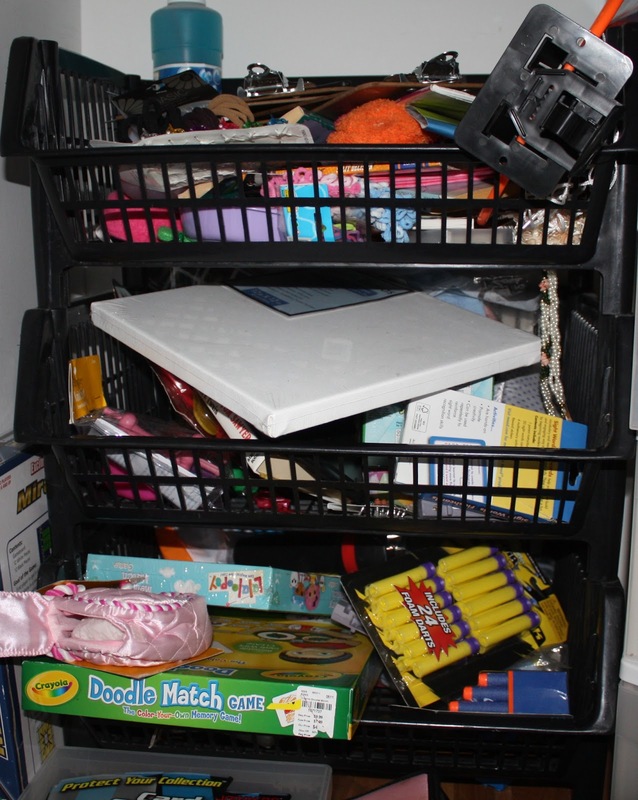 Throughout the week if the kids leave items out after bedtime, those go in the bin or if they don’t clean their room that’s a ticket, the premise is, each item or ticket is worth a quarter OUT of their allowance. However, they can also earn plus tickets for kind behavior or doing an extra job and those are also worth a quarter. Every Wednesday mom (yes it’s always mom) goes through the bin and sorts out four piles, one for Caleb, one for Tate, one for Mya, and one for Mabel. Their allowance is then calculated according to how many tickets or items they have in the bin, and they have to immediately put their stuff away. But the system doesn’t end there. We, the parents discovered, that the kids really didn’t care about what they got in the bin because there weren’t any negative consequences attached to the tickets or the items other than not getting money and money doesn’t mean a whole lot to our children. So my smart husband implemented the idea that each item they got would also equal a chore that had to be completed on Saturday morning. This was a brilliant plan for mom because now every Saturday morning I get to custom design specific chore charts for each child (Tate is an AWESOME vacuum operator) who had items in the bin (they ALL always have at least something) and my house gets clean, kind of . Then, after their chores are completed and inspected, they are allowed to “shop.” By shop I mean, shop in the little store we set up in an extra closet in our house. The store consists of mainly dollar store finds and clearance items with the occasional big ticket item like a Wii game for anyone who wants to save their money. The Store – it’s not pretty or tidy, but it does the job. This system has saved my rear end as a mother. I no longer nag about anything. If there is something laying out at the end of the day, it goes in the bin. If someone is back talking, I just write a ticket, I save my voice (and my sanity), the kids learn responsibility, and the house gets semi-clean once a week. More to come! How do you keep order? I’d love to hear about it and maybe implement another system!